The 2016 SEGD Global Design Awards are now closed. Enter the 2017 SEGD Global Design Awards starting 12.01.2016. 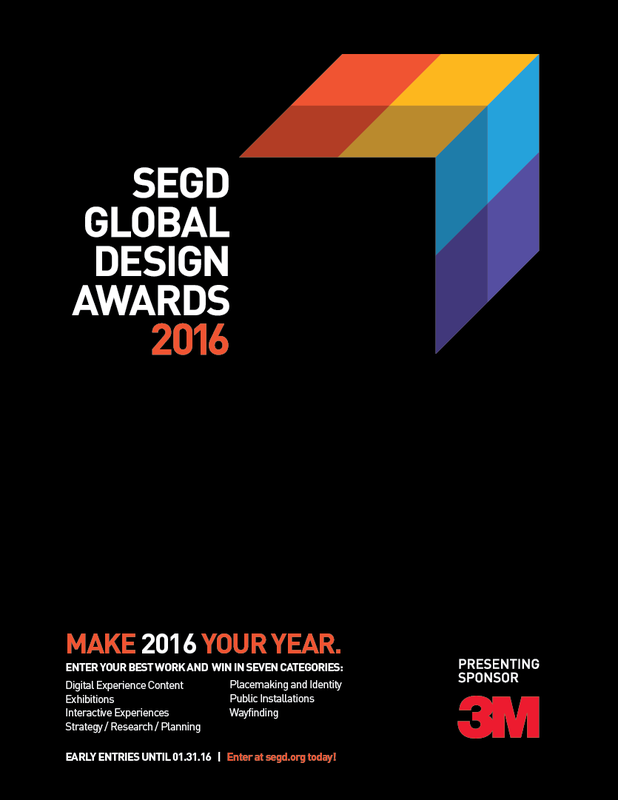 Winning entries will be announced and celebrated at a dedicated SEGD Global Design Awards ceremony 06.11.16 at the SEGD Conference Experience Seattle. Check out the 2015 Winners gallery. 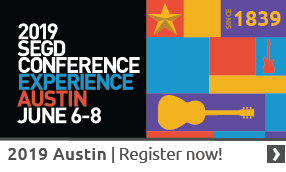 Since 1987, the SEGD Global Design Awards have set the standard of excellence for environmental graphic design and experiential graphic design—honoring design work that connects people to place by providing direction, content, and compelling experiences in public spaces. Winning projects have ranged from interactive multimedia environments to complex hospital wayfinding systems and from branded corporate environments to museum exhibitions. 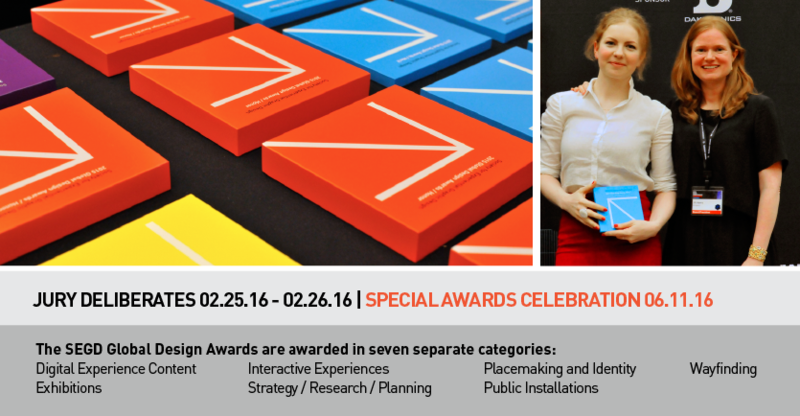 Retail and interior projects, architectural signing, public art, design research, and books have also won awards. Awards are conferred by multi-disciplinary, international juries. Past jurors have included Henry Beer, Peter Dixon, Sue Gould, Graham Hanson, Lars Uwe Bleher, David Vanden-Eynden, Kelly Kolar, Ken Carbone, Mitchell Mauk, Ronald Shakespear, David Gibson, Paul Prejza, Lance Wyman, and Virginia Gehshan. Here are some ideas of types of projects you could enter under the above seven categories. Do you have burning questions about the 2016 SEGD Global Design Awards? Call or emailJennette Foreman, +1-202-638-5555. We constantly hear feedback about the high standards that the SEGD Global Design Awards set because of the rigor of the jury process. So you're a Designer, Fabricator, Client or Student from anywhere in the world, and you've got an amazing project you or your team completed between 1/1/2013 and 12/31/2015 in one of the following categories: Exhibitions, Placemaking and Identity, Public Installations, Strategy/Research/Planning, Wayfinding, Interactive Experiences, and Digital Experience Content. And you want to enter (and win!) an SEGD Global Design Award. Katie Bevin speed-launched her design career. Anthony Vitagliano’s company attributes growth and new clients to winning. And Wendy Evans Joseph just keeps challenging herself year after year with the SEGD Global Design Awards. Winning is good. Winning is very, very good. Enter now and change YOUR life too! What do a Hell’s Kitchen bus terminal, a quilt show, a cathedral and a football stadium wayfinding program have in common? 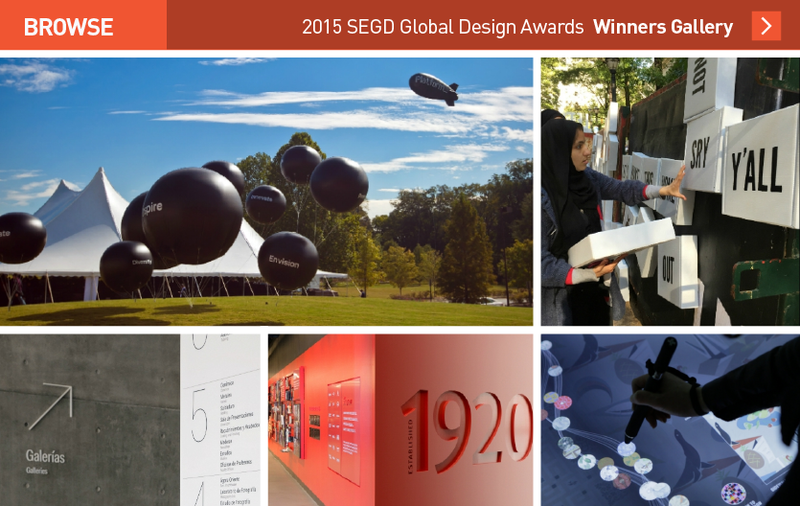 All were awe-inspiring, game-changing projects recognized in the SEGD Global Design Awards. Don Shula was probably talking about football (not design competitions), but the famed coach’s wise words hold just as true for designers as for football players, or anyone with a worthwhile pursuit. Starting is always the hard part. As the only international design awards program focused solely on Experiential Graphic Design, the SEGD Global Design Awards seek out and recognize the world’s best examples of experiences designed to connect people to place. The SEGD Global Design Awards encompass 7 categories that represent key practice areas of Experiential Graphic Design. We'll explain them here. Entering Design Competitions is Good for Business. Here’s Why. At their best, design competitions promote innovation, creativity, excellence and sheer possibility. Who doesn’t want to be aligned with those? And winning, of course, brings validation and acclaim. But it’s not all about the glory. There is actually a business case to be made for entering design competitions—whether you win or not. 2016 is your year to shine. 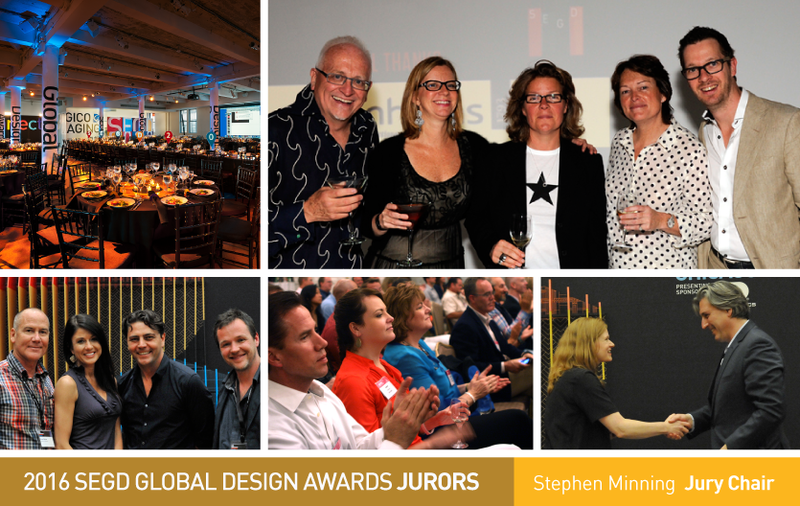 Submissions are now being accepted for the 2016 SEGD Global Design Awards, the only international awards program focused solely on user experiences in the built environment. The deadline for submissions is Jan. 31, 2016, but it’s never too early to get started!